The Commonwealth Avenue project was massively disruptive but was completed quickly. One bridge is more than a century old, and 1,100 feet long. The other is about half that age and a few hundred feet shorter. Both are on city streets that carry tens of thousands of cars a day in and out of Boston, one over a highway and rail tracks, the other over a river. One took less than six weeks to rebuild. The other will take five years. The Commonwealth Avenue bridge project was that rare thing in construction: a big job, done fast. State highway officials used a technique called accelerated bridge construction, in which many of the main components are built off-site and then dropped into place by crews working in 24/7 sprints. Though finishing work will continue in the coming months, the hard part is already over. Work on the next Boston bridge to face extensive repairs will be far more grueling. It’s the North Washington Street Bridge, which connects Charlestown and the North End, and the job will take five years. “It’s going to be a very difficult project. We’re doing everything we can to mitigate traffic impacts during that period. But without a doubt it’s going to be a lot of construction,” said Jonathan Gulliver, the state’s highway administrator. Unfortunately for commuters, the state Department of Transportation cannot — or will not — use the same accelerated approach it employed on Commonwealth Avenue. The main reason is the sheer scope of the job: North Washington needs to be completely rebuilt, including its supporting piers in the Charles River. Commonwealth Avenue, on the other hand, needed only a new deck. Other reasons are financial. There simply is not enough money or enough people at the Transportation Department to make every bridge project an accelerated one, Gulliver said. The Commonwealth Avenue bridge cost about $110 million — about 20 percent more expensive than it would have been under a normal construction schedule, according to state officials. At North Washington Street, meanwhile, the state is already fretting about the cost: The winning bid came in $25 million higher than expected, and the project is expected to cost around $200 million. Dawn Lehman, a professor who specializes in bridge engineering at the University of Washington, said it’s possible to build a bridge’s base structure using accelerated techniques — even in water. But it’s far more complex. Indeed, state officials said, the Y-shaped piers for the North Washington bridge are difficult to build ahead of time because they must be firmly planted in bedrock, which requires drilling 40 deep shafts underwater. Moreover, the state plans to keep half of North Washington Street open to traffic while it works on each half of the bridge. 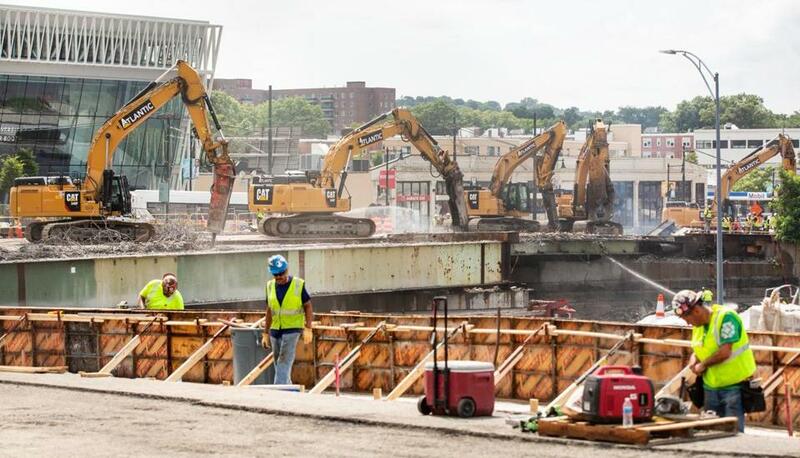 The Commonwealth Avenue bridge, by contrast, was closed to most vehicles during the replacement, making room for each half to be quickly demolished while keeping the rest open to pedestrians, cyclists, buses, and emergency vehicles. Officials were also able to close part of the Massachusetts Turnpike to give themselves more working room during demolition. The Charles River underneath the North Washington bridge offers no such flexibility. Commonwealth Avenue was rebuilt in two bursts this summer and last. While that may have seemed like short work to the public, planning for the project began in 2011, and the contract was awarded in 2015. Components like steel beams and concrete panels were assembled far in advance, and staged mostly out of sight of motorists. Meanwhile, the start of the project was delayed a year, because of an issue with the design of the steel girders. Once it got going, the job was massively disruptive, shutting down a stretch of Commonwealth Avenue to all private vehicles, forcing the MBTA to run shuttle buses in place of the Green Line, and causing lane closures on the turnpike below. But it was over in a hurry. Massachusetts used accelerated construction in 2011, replacing 14 bridges on Interstate 93 over several weekends, and more recently to replace part of Route 3 in Braintree. Highway authorities across the country are increasingly doing accelerated construction for bridges. North Washington Street will be more of a conventional, long-term slog. Later this year, work crews will begin moving the many utility services that cross the bridge; construction will start next spring, the first of several stages. Overall, the bridge will be demolished and replaced in halves, with traffic sliding to the inbound lanes while the outbound side is replaced, and vice versa. Three lanes of traffic will remain open on the half of the bridge that isn’t under construction — two inbound, one outbound to Charlestown. During certain periods, only one lane will be open each way. The ripple effects could further slow the already-crawling traffic into downtown Boston, threatening to create backups on Interstate 93. North Washington contractor J.F. White also just completed the rebuilding of the Longfellow Bridge, which ran two years over schedule. The contractor has an incentive to move quicker this time: fines of $40,000 a day if the project runs late. Once complete, the new structure will feature two lanes for traffic in each direction, plus a third inbound lane just for buses. It will also include sidewalks, separate cycling lanes with physical dividers, and landscaping. If there is a silver lining for commuters, it’s that they’re somewhat used to disruption. The two center lanes of the bridge were shut some 15 years ago, while another outbound lane was taken out of commission last fall due to “deterioration,” according to city and state officials. Paul Donahue, a Winchester resident who commutes across the bridge most days, said lane closures have already caused long delays, a “precursor” to the reconstruction. He urged city and state officials to aggressively manage traffic flow during construction, by deploying officers to enforce traffic laws.